I’ve been a bit boring lately so haven’t had many new reviews for you to read, so I thought I would write about some of the books I’ve been reading lately. Last year, I came across Snowing in Bali – a best-selling novel by a journalist called Kathryn Bonella. 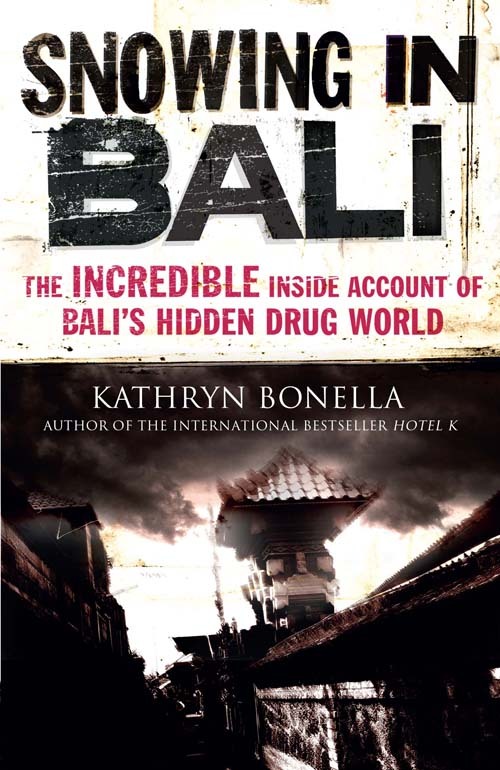 Reading on the cover that it was an “incredible inside account of Bali’s hidden drug world”, I was instantly intrigued. I’m one of these people who has no set taste in books – I can flit from a romance novel to a brutal dystopian thriller and enjoy both. I actually prefer to change the type of book I am reading each time I pick one up to keep things fresh and to try to cover a range of different topics and themes. I guess that’s the English Literature degree rubbing off on me after reading fairy tales alongside historical texts and tales of murder – you just can’t pin me down to one genre! So when I spotted this book, I was instantly drawn to it – I loved the fact that it was written by a journalist who had spent a huge amount of time researching within the prison and speaking to the prisoners themselves. The fact that Bonella is a journalist suggested the story would be more insightful and balanced, perhaps offering a different angle. It was also something that I had never read about, so I was intrigued to read about the scale of drug trafficking and how it controls the very culture of Bali. I was not disappointed – the story was fascinating as Bonella looked through the eyes of various prisoners and their experiences in the drug trade – how they became involved, how they were framed, the dangers of the trade, how they became addicted to the lifestyle. The story was well written and you became involved with the characters – forgetting to judge them for their actions and instead understanding how easy it was to slip into this way of life when living within such a corrupt country. Working as a journalist myself, it was interesting to see how the author had approached the interviews and how she had constructed the text – much like a newspaper article but in far more depth. But what really kept me reading was my longing to know what would happen to the characters in the end – like I said, you could really identify with some of them – others were just hilarious. It was a really interesting view of a world that most of us are blissfully unaware of and gave readers an insight into the realities of life in that ‘perfect’ honeymoon destination – Bali for locals at this time was a corrupt, poverty-stricken place and clearly for many, ferrying drugs was the only way to survive and make a living. It also showed the involvement of foreigners (i.e. British holidaymakers, travellers from the US and all over the world) plus the routes and relationships with other countries. A really good read – gets a bit slow in the middle but soon picks up again and worth seeing through to the end. Also really great the way she has incorporated pictures of some of those mentioned in the book – really helps bring home the fact that although this is a narrative text with names changed – it is all based on real events and what has been said by those who have experienced or seen first-hand the events. Once I finished Snowing in Bali, I couldn’t stop going on about it to friends and family – it was one of those books that you want to tell everyone about. It was the third book by Bonella, who had also penned a best-selling autobiography, Schapelle Corby – My Story. While writing this book, she also researched for international best-seller, Hotel K, which was described as “the shocking inside story of Bali’s most notorious jail”. I was so pleased when my boyfriend bought a copy of Hotel K – I had been dying to read it since putting down Snowing in Bali and could barely wait for him to finish the book before starting it. If I thought Snowing in Bali was good, Hotel K is even better! It focuses more generally on life in the prison which is simply fascinating – a completely different world full of drug traffickers, thieves, murderers and more. It shows the extent of the corruption, with money being the route to a comfortable stay in Hotel K and a chance to keep the guards sweet and on your side. Interestingly, you also get to see the effects that gangs and large-scale criminals had on the prison when they were sent down for their crimes – this includes the Bali Bombers, a Balinese King, Gordon Ramsay’s brother Ronnie and the Bali 9 among others. It was an incredible read that challenged everything you thought you believed in as you learnt the stories behind the crimes, heard the astonishing logic and reasoning behind the crimes and saw the cruelty and hideous conditions all of the criminals were subjected to – whether murderers or petty thieves. I was gripped from start to finish and would seriously recommend this book to anyone – it was easy to read and followed some very interesting characters. Both books were amazing reads and gave a great opportunity to understand the darker side of the Bali culture that lurks just beyond the white, sandy beaches and tropical sunshine. Both are books that change the way you think about right and wrong and the justice system. Oooh I definitely want to get my hands on the Hotel K book that looks right up my street, and also something one of the girls in my old part of the office would love, she’s studying criminology at uni and loves all that type of inside info on crime matters. Thanks for sharing these reviews.